This healthy meal is a favorite in our family, the cauliflower, peas and potatoes give you a great balanced meal. This is a traditional Gujarati dish, part of a thali eaten with chapatis, this is one you must try and send us photos of. Supermarkets have all the ingredients frozen ready to cook. e.g. the cauliflower just need to be cook as normal then when they are soft cut them into smaller pieces. This dish is one of our family favourites dishes and it is perfect for those days when you don’t have much time to cook and you are super hungry. Sometimes we use the frozen cauliflower which can take a little longer to thaw but still tastes amazing, other times we use the fresh cauliflower which is cut into 2cm pieces and if you cut the potatoes in the same size it will help cook the ingredients equally. There is nothing worse than an uncooked potato but if you follow the simple steps below i’m sure you will create the perfect dish. This dish is one of our family favourites dishes and it is perfect for those days when you don't have much time to cook and you are super hungry. Sometimes we use the frozen cauliflower which can take a little longer to thaw but still tastes amazing, other times we use the fresh cauliflower which is cut into 2cm pieces and if you cut the potatoes in the same size it will help cook the ingredients equally. There is nothing worse than an uncooked potato but if you follow the simple steps below i'm sure you will create the perfect dish. Heat the oil in a non stick pan on a medium heat. 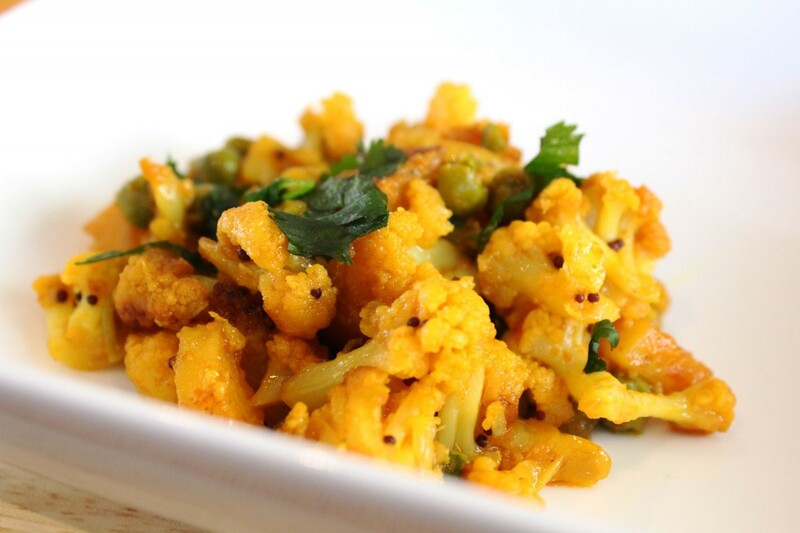 When the oil is hot put in the dried chilies (3), mustard seeds (1/2 tsp) and asafoetida (1/4 tsp), the mustard seeds will start to pop, and once that happens put in the cauliflower stir the ingredients and cover. Keep stirring for 5 minutes until the cauliflower is a little soft this is when you put in the potatoes and peas. Put all the ingredients apart from garam masala. Cook until the vegetables are cooked (soft) and water is reduced. By all means add chilies or salt to taste after tasting. When the vegetables are cooked sprinkle the garam masala and garnish with coriander. 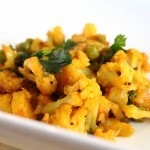 serve with roti, naan, chapatis or whatever you desire, enjoy !